The 9s are one of the longest-running and most popular original bands in Omaha. Described as “Prince meets Steely Dan,” The 9s high-energy shows are legendary in the local scene, filled with clever lyrics, hook-filled choruses, and musicianship that is second-to-none. 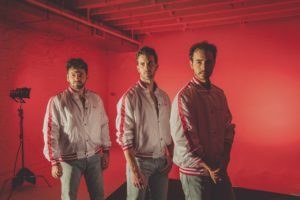 Known for their incredible live shows from clubs to arenas to festivals, THE SHADOWBOXERS, whose three-part-harmony captivates audiences, are carving their niche as a modern day Bee Gees. APOLLO, the band’s debut EP, was co-produced by Timberlake and Israeli writer/producer K-Kov. The lead track RUNAWAY made its broadcast television debut on The Today Show, followed by another live performance on The Talk. The band is writing and recording new music and have released singles including STOP, FINDING A PROBLEM and most recently, TELEPHONE, co-written with Timberlake. They have since garnered over 6.5 million streams of original material on Spotify and Apple Music and over 110K followers on social media to date and growing. 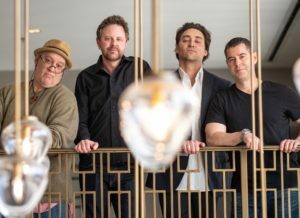 Members Matt Lipkins, Scott Tyler and Adam Hoffman experienced an almost instantaneous musical compatibility when they first started writing together in college, since forging a cohesive sound based on a shared reverence for the strong, taut harmonies of the Bee Gees, CSN and Earth, Wind & Fire and the rhythmic pop funk of Prince, D’Angelo and Michael Jackson.